For many years Shaftesbury parish generously supported the ‘India Fund’ that was run by Fr Brian Reeves (parish priest until 2005). 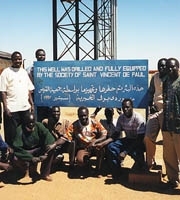 The fund enabled the parish to establish a specific connection with people in the developing world and committed us as a parish to these people. In addition, it was often noted that parishioners appreciated being able to see exactly where their donated money was being used. Sadly, however, the fund was closed after Fr Brian’s retirement. In 2008 a branch of the SVP was established in Shaftesbury to serve the N.E. Dorset area, as described on another page of this website. Through the SVP’s international branches, various twinning connections have been established to aid local SVP projects in the developing world. These twinnage programs mean that local British donations can be directly targeted to a local group abroad. With the support our our parish priest, our local SVP has now established a successor to the old ‘India Fund’ and we hope that this will respond to a number of requests in the parish that something like this be done. It is planned that this will be an ongoing fund and a new wall box slot has been established at the back of the hall to receive donations. This will be a parish fund, administered by the local SVP branch. What is “Feed my Lambs”? “Feed my Lambs” is a project run by the SVP (Society of St Vincent de Paul) that provides practical help in feeding starving babies in Sudan. This is the project that is being supported by the new parish fund. The fund was established in 2006 by Ian Mawdsley, a member of the International Relations Committee of the St Vincent de Paul Society (England &Wales). Ian visits Sudan regularly and sees firsthand the work done by the feeding centres run by the SVP in the refugee camps near Khartoum. This provides us with assurances that the money we donate is being appropriated properly. 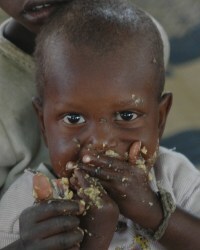 Photos of him visiting the feeding station in Sudan can be seen at the main SVP Twinnage website. Recent annual reports on the Sudan project can be read by clicking this link here. 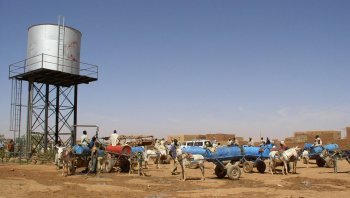 In Sudan, the members provide fresh water from an SVP well (as in the pictures to the right), run orphanages, foster homes, clinics and vocational training workshops, as well as feeding up to 10,000 babies every day. This said, the particular target of the funds raised by the Shaftesbury Sudan Fund will be the feeding stations in Khartoum. How is the money sent to Sudan? The Shaftesbury SVP has a separate bank account that will be used for all donations for the new Sudan fund. The money donated in Shaftesbury is sent directly to the bank account of the local SVP project in Khartoum so that they can draw on the funds to purchase the food needed at the feeding stations. No money is lost via intermediary bureaucracies. As in the rest of the world problems have been caused by generations of civil unrest. Millions have been killed or displaced. These are the people being helped by the SVP. 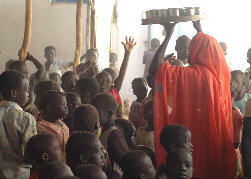 The feeding centres are located in the camps for people displaced from southern Sudan and Darfur. The babies are fed mainly by volunteers, many of whom have gone through serious problems themselves. By cash: in the “Sudan SVP” wall box in the hall. If you can Gift Aid your donation please use one of the envelopes provided.